Functional tissue engineering for the regeneration of cartilage tissue damaged by disease or trauma relies on the approach of using scaffolds, cells, and exogenous factors to develop tissue constructs capable of meeting the functional (mechanical) load-bearing demands in vivo. Our laboratory has approached this paradigm with a long-term hypothesis that by first cultivating constructs in vitro to match the material properties of native cartilage, prior to implantation, long-term success is improved. We have manipulated aspects central to the themes of tissue engineering to produce engineered cartilage with functional properties including cell source selection, chemical supplementation, and mechanical stimulation. Furthermore, when regenerating larger, more anatomically relevant surfaces, issues of nutrient diffusion have posed a considerable challenge as well as techniques to replicate the desired surface geometry. Many of our studies have utilized isolated juvenile bovine chondrocytes encapsulated in hydrogel systems to recreate and even surpass the properties of native bovine tissue by the temporal application of chemical or physical factors, or a combination of the two. While these studies capitalize on the significantly greater biosynthetic capacity of juvenile cells relative to their adult counterparts, juvenile cell sources are limited for clinical applications due to challenges related to tissue procurement. We have also explored the use of differentiated adult chondrocytes from the diseased knee that have been harvested during preliminary debridement procedures, though obtaining sufficient cell number to produce constructs with sufficient mechanical properties is challenging due to the reduced biosynthetic activity of cells from patients with advanced stages of the disease. These cells may also express a phenotype more characteristic of OA cells, and we're actively investigating the role of cell memory and fate and how they may influence engineered cartilage. 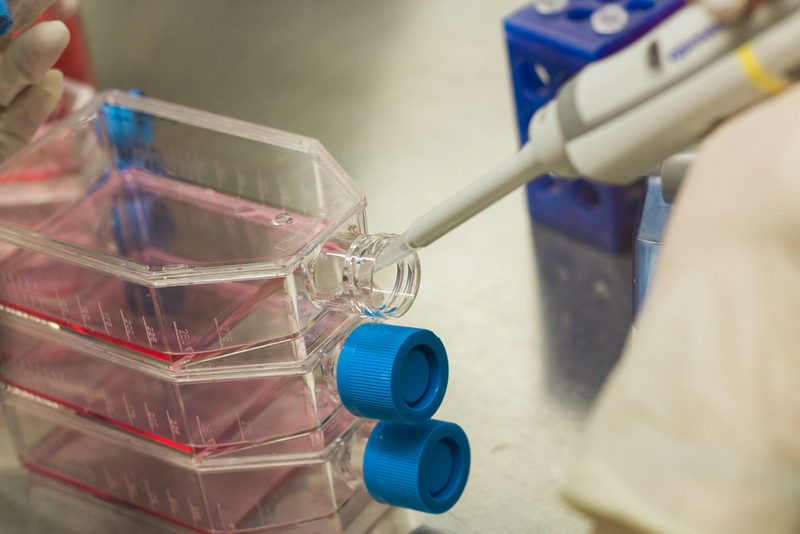 Alternatively, due to the immunopriviledged nature of diarthrodial joints, we have also worked with allogeneic cells from other patients, harvesting donor tissue from the Musculoskeletal Transplant Foundation and expanding the cells for our use. Finally, our work has also extended toward the use of undifferentiated cartilage precursor cells, including those isolated from bone marrow aspirate, adipose tissue, and from the synovium. Constructs made with these cells, however, have not yet been capable of attaining mechanical properties at native tissue levels. Ongoing work is examining exogenous factors that may influence the development of engineered cartilage from these cell sources. Regardless the source, the number of cells required to recreate engineered cartilage with functional properties surpasses the number that is readily available clinically. To address the limited supply of cells, one way to increase the cell number is by expanding cells through passaging under appropriate growth factors that also work to prime the cells to reactivate rapid matrix synthesis when cultured in a 3D scaffold environment and prevent phenotype dedifferentiation which is typically seen in monolayer culture. Cell expansion and passaging, however, can produce cell-to-cell variability and introduce asynchrony in cell cycle progression. We have found that this asynchrony hinders the efficacy with which stem cells can be differentiated into target cell types as the cells may be responding variably to exogenous factors. To counter this heterogenous response, we are developing a platform technology that reliably synchronizes large quantities of cells to the same phase, effectively priming them to respond to external cues. Joint loading gives rise to a plethora of physical stimuli, including osmotic loading, hydrostatic pressure, electrokinetic phenomena, stress and strain. We apply physiologically relevant stimuli to encourage the development in vitro for tissues to meet the in vivo functional demands as well as mimic the composition of native tissue. In particular, we have focused on the use of applied physiologic hydrostatic pressure and perfusion as well as physiologic dynamic loading to reproduce the physiologic deformational loading and hydrostatic pressure environment of the chondrocyte. We have shown that our paradigm of physiologic loading can achieve near-physiologic values for equilibrium modulus and glycosaminoglycan content, stemming from an enhanced convection of nutrients. Concurrently, through a collaboration with Dr. Michael Bottlang at Apex Biomedical, LLC, we are investigating the impact of low-strain physiologic loading on the development of engineered tissues. With MATE (Mechano-Active Tissue Engineering), we are able to apply dynamic compressive stimulation during long-term culture while at the same time measuring changes in tissue properties such as thickness, modulus, and creep. 6 independent voice coil actuators allow for the individual analysis of each sample, allowing for robust statistical outcomes with a decrease in total sample number. Together, these features allow for improved analysis of culture conditions and optimization of growth parameters. In addition to mechanical loading, many groups have focused on the application of a range of chemical cues, including growth factors, corticosteroids and interleukins, in order to promote tissue growth. The exchange of these chemical factors, via paracrine signaling and direct cell-cell contact, has been found to promote extracellular matrix development. When combined with physical loading, we have observed possible synergies as deformation of the tissue increases the convective transport of these soluble factors. To this end, we have also explored the benefit of embedding dexamethasone-laden microspheres within engineered constructs to promote more homogeneous tissue development. Our interest in chemical factors is motivated by the injured joint, where the chemical environment is likely to contain potent catabolic mediators that stem from chronic joint inflammation or surgical intervention itself. As such, we are actively investigating the impact of and developing strategies for the mitigation of the degradative action of these catabolic factors. Initial work characterized the response of both native articular cartilage and engineered cartilage to in vitro cytokine exposure and found a direct correlation between cytokine concentration and catabolic degradation. To address this relationship, our lab has traditionally focused on using only engineered constructs that possess the mechanical and biochemical integrity to withstand the harsh mechanochemical environment of the joint. Recent work has focused on approaches to prevent or directly mediate the effect of cytokines on developing constructs. In particular, we have examined cellular preconditioning schemes involving a low-dose administration of cytokine as well as internal steroid release to modify the cellular response to pro-inflammatory cytokines. Biodegradable polymers, such as poly(lactic-co-glycolic acid), or PLGA, are widely employed as drug delivery vehicles in biomedical applications. Through modification of their chemical organization, the pharmacokinetics of the drugs inside can be altered and optimized for specific applications. For cartilage tissue engineering applications, our laboratory has successfully deployed dexamethasone-loaded microspheres for the development and protection of tissue engineered articular cartilage. By delivering this potent anti-inflammatory steroid at a therapeutic and safe level, we are able to promote robust deposition and organization of the extracellular matrix while conferring protection against pro-inflammatory cytokines. In addition to the potential use of tissue-engineered cartilage grafts in vivo, ongoing work investigates the potential of this therapy as an acellular approach in osteoarticular transfer systems following autologous repair of focal defects. Recently, we've begun investigating the use of these systems to treat arthrofibrosis following total joint arthroplasty by employing a small molecule TGF-beta inhibitor to hinder fibroblastic proliferation and biosynthetic activity. Early in vitro success in disrupting TGF-beta-mediated contractures using the inhibitor are promising and suggest potential therapeutic usefulness. By optimizing the microsphere fabrication process to encapsulate and deliver this inhibitor for up to 3 months, we hope to alleviate joint stiffness, reduce the incidence of contracture scarring, and reduce the amount of pain experienced by the patient associated with arthrofibrotic development following total joint arthroplasty. For large osteochondral defects (greater than 10 squared cm), osteochondral allograft implantation is an effective cartilage restoration technique, though the demand far exceeds the supply of available quality donor tissue. As such, large bilayered engineered cartilage tissue constructs with accurate anatomical features (i.e. contours, thickness, architecture) could be beneficial in replacing damaged tissue. We have developed a framework for the fabrication of large osteochondral constructs with correct anatomical architecture and topology through a combination of high-resolution imaging, rapid prototyping, impression molding, and injection molding. With large constructs, however, nutrient diffusion limitations may pose a challenge to developing tissues with homogeneous matrix deposition. We have been developing a number of different strategies to counteract these potential limitations, including the addition of channels and microbubbles. Additional strategies involve first growing smaller pieces in culture and assembling them later to form the entire surface.